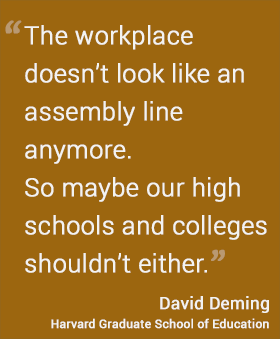 Since 1980, Deming finds, jobs that require a high degree of social skills — consulting, project management, and positions in fields like medicine, dentistry, and the law — have experienced greater employment and wage growth at all levels, relative to other jobs. Cognitive skills are valuable, Deming concludes, but not in isolation. Jobs that require high levels of both cognitive skills and social skills have seen the highest levels of employment and wage growth over that time period. But employment has fallen in occupations that draw solely on cognitive skills — for people like actuaries, statisticians, chemical technicians, and machinists, all with high math but low social skill requirements. Deming shows that women have disproportionately benefitted from the economy’s overall validation of social skills. As he notes, the well-documented advantages for women in interpersonal, collaborative skills may account for their outsize presence in the economy’s growing allotment of social-skill-intensive jobs — and may help explain the narrowing of the gender gap in employment and earnings. Deming plans to follow these gender issues in future work. The results of his current project suggest that “cognitive skills are increasingly a necessary but not sufficient condition for obtaining a high-paying job,” Deming says. The more routine an occupation — a condition that he found to strongly correlate with lower demand for social skills — the more susceptible that occupation is to automation and decline, as computer technology encroaches on workers performing rote tasks, even complex ones. The advance of technology is often seen as a threat to the overall labor market, but Deming’s study could calm fears that computers are coming to replace us all. As he notes, employers cited “ability to work in a team” as the most desirable attribute of new college graduates, ahead of problem-solving and analytical/quantitative skills, when the National Association of Colleges and Employers asked them in its 2015 survey. It’s what computers can’t do that employers most want. So what's the message for schools and colleges? First, there’s the labor-market endorsement of social-emotional learning initiatives. More broadly, there’s the suggestion that the time is ripe for innovation in the classroom. “It is striking to me how much a high quality preschool classroom looks like a modern workplace,” Deming says. “Children share resources and experiences with each other and move flexibly between tasks and roles. Learning is immersive and often implicit – even for ‘hard’ skills like math and literacy. “Some K–12 and college classrooms look like this as well. But lecture-style direct instruction is the norm in many high schools and colleges that we think of as high quality. This learning style has its roots in the mass high school movement in the U.S. that began around 1910, and it is closely linked with advances in mass production that occurred around the same time.